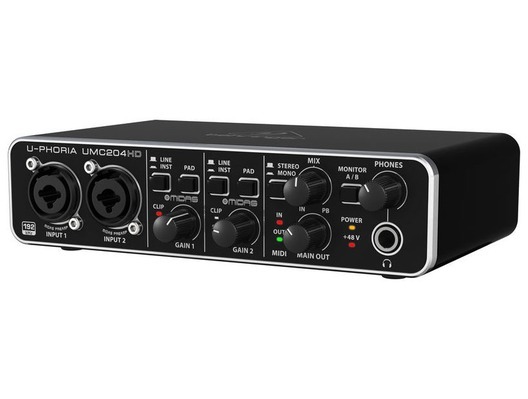 The Behringer U-Phoria UMC204HD is a audiophile professional studio USB audio interface that has been designed to record microphones and instruments. It has both XLR and TRS inputs giving you more options as to what equipment you can plug in! The Behringer U-Phoria UMC204HD features high quality 24 bit / 192 kHz audio conversion. The incredible U-PHORIA UMC204HD bridges the gap between your creativity and your fans. This blazingly fast USB 2.0 studio in a box will have you recording your next masterpiece in minutes with all the connectivity required for your microphones, guitars, keyboards and even MIDI devices. Record the perfect vocal right to your computer-based DAW thanks to the 4 astonishingly pure, world-class MIDAS-designed mic preamps, which include +48 Volt phantom power for condenser microphones, all going through studio-grade 24-Bit/192 kHz converters for the best possible sound quality. Whether you're a singer-songwriter, producer on the go, or just need a rock-solid interface for running backing tracks at a gig, the ultra-dependable U-PHORIA UMC204HD will help you shine in the digital domain. When it's time to make recording history on your Mac or Windows computer, plug in microphones, instruments or line level sources to the UMC204HD's 2 combination XLR/TRS inputs for the ultimate in studio flexibility! Connect and communicate with MIDI devices to add the benefit of control surfaces to your studio workflow. You take your tracks seriously, and the UMC204HD respects that, providing up to 192 kHz resolution for even the most demanding applications in music as well as video post production. Work with confidence and accuracy in your favorite recording software for professional results every time. Ever since its formation in the 1970s, MIDAS has had a long history of innovation and leadership in the world of audio mixing consoles. Employed by the most famous touring acts and installations world-wide, legendary MIDAS consoles such as the XL4 and Heritage H3000 quickly became industry standards. MIDAS has earned their impeccable reputation due to their no-compromise approach for audio and build quality and in particular for their Award-winning Mic Preamps which are considered by industry experts as the industry's best sounding designs. Building on this legacy, the XL8 and PRO Series of Live Mixing Systems continue this great heritage of Award-winning audio quality. BEHRINGER is proud to incorporate a MIDAS designed mic preamp for the ultimate in high-quality audio reproduction in both live and studio environments. The UMC204HD mix control allows zero-latency direct monitoring, which means musicians can experience their performance clearly - with no delay or lag in the returning signal, resulting in a better performance and recording. A powerful phones output has its own level control and Monitor A/B source select for DJ-style cueing. To make it a done-deal, we provide free audio recording, editing and podcasting software, plus 150 instrument / effects plug-ins - just a download away at behringer.com. Here we have the Behringer U-Phoria UMC204HD USB Audio Interface in brand new condition and in B-Stock. The B-Stock versions would have been on display at a training evening or trade exhibition only and will come boxed 'as new' with all accessories and a 1-year warranty. Analog Inserts for use of external effects such as compressors, etc. Had a bit of trouble getting it to work until I found the drivers on the behringer site.Was deep in the instructions. Once downloaded was fine. Could be a bit clearer as I thought it was plug and play..
You may be tempted to splash out cash on a Scarlett 2i2 but this is every bit as good at less money. Sound quality is superb, build quality is excellent and does exactly what it says on the tin.